Another commission for a client- this one is from the 1986 Sci Fi film- THE FLY which had some great practical special effects with the transformation of the main character into a fly-human hybrid, the “Brundlefly”. 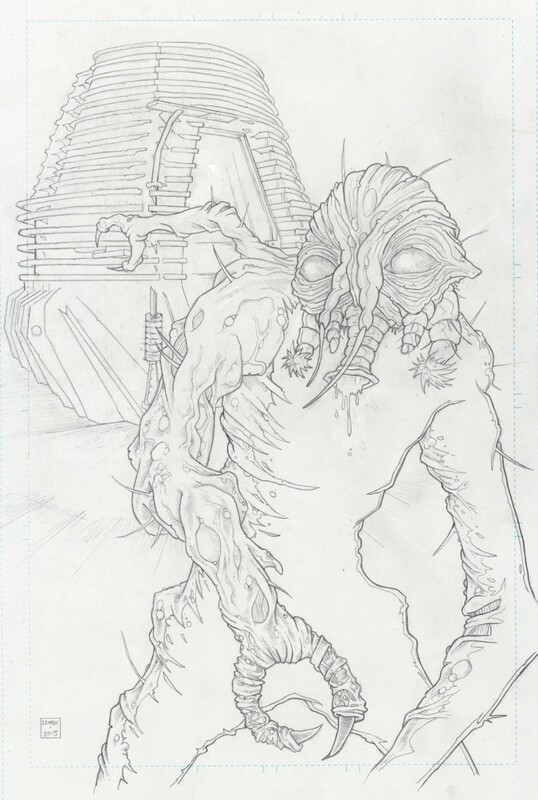 So for this project, I wanted to highlight the creature which plays to my inking skills to really make the grotesque come to life, and I wanted to show the iconic teleportation pod. From a composition & lighting viewpoint, I wanted to back light the creature and make some large dark areas of solid black, so you can see my backlit lighting layout in the blank spaces coming out of the right side of the Brundlefly and the left side is just a small lit outline.